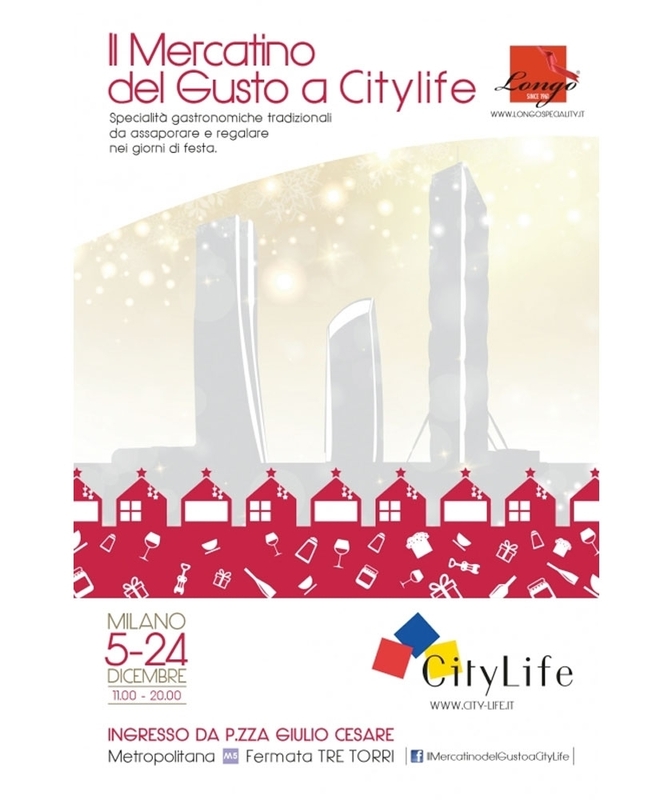 From 5 to 24 December 2015 we looked forward to seeing you at an amazing gastronomic experience in the shade of the CityLife skyscrapers, the new Milan emerging from the ex-Fiera Campionaria area, which can be reached from Piazza Giulio Cesare or the Lilla metro line, Tre Torri stop. An exclusive market includes all the amazing things in our culinary heritage. Called the CityLife Mercatino del Gusto since, unlike many markets which spring up everywhere for upcoming festivities, it is not for handcrafted items. The diverse and original market is specifically for foodstuffs. The market focuses on our superb traditional Italian gastronomic heritage, food in various guises, from sweet to salty, cellar to pantry. These are top of the range products selected by Longo Un Mondo di Specialità, the leading company in the gastronomic corporate gifts sector (Christmas baskets and gift boxes exported worldwide). The CityLife Mercatino del Gusto has the appearance of a traditional market: with a series of 23 charming lodges, each of which hosts a company which displays their finest produce. Christmas is a time when we all revert to being a child again, when we cannot resist sweet things, the siren call of panettone becomes ever stronger with each passing moment. The wide range of sweets at CityLife Mercatino del Gusto begins with this essential delicacy. A classic in a traditional or innovative version, from a confectionery brand that cannot be bought elsewhere. With its colourful burgundy packaging, Bardi is the sweetest Christmas delicacy there is. From one classic to another, deliciously soft, fragrant torroncini, which epitomises the art of Sicilian confectionery, centuries-old almond nougat from the Venetian company Bauce, plus a huge selection of chocolates, an extraordinary gift from the New World enthusiastically and valiantly interpreted by companies such as Cioccolateria Bodrato on the old continent. It is a real experience to admire the hot chocolate fountain freshly prepared by Marco Colzani, the latest descendant of a confectionery dynasty, who with Cassago Brianza have been able to win the most prestigious master chocolatier awards in Europe. The art of Italian pastry is represented by a range of biscotti that made the region they came from famous; Novara biscotti from the historic confectioners Camporelli and Falanga’s formelle all’arancia, the flavour of Sicily, which arouse a lot of interest, have an entire stand to themselves. Having assuaged our child-like imagination, it will be equally irresistible to seek out other delicacies among the traditional specialities which represent the best of Made in Italy gastronomy, based on the extraordinary variety of Italian produce. Simple products that are real delicacies, due to artisan craftsmanship, such as the successors of Amerigo, who manage La Dispensa. This simple trattoria has for eighteen consecutive years featured in the Michelin Guide. Tortellini, tigelle, sughi stellati and sottoli for all those who come to CityLife’s Mercatino del Gusto looking for flavours of the past. The pride of Italy are the many and varied cheeses, a huge variety representing the cheesemaker’s art. Guffanti expertly selects these from all over Italy for his stand. From goat’s milk Robiola to Parmigiano, saffron-infused bagoss to caciocavallo, pecorino to mozzarella, not forgetting mascarpone. Many people come from Milan to Arona on Christmas Eve to stock up because there is none better. Nowadays, street-food has become fashionable but its pioneer was Giuseppe Zen. The first Italian street-food, first in terms of both time and quality. From his stand wafts the aroma of polenta concia, panini al lampredotto and mulled wine. Aromas from the past which offer a new sensory experience for today’s palate. Talking of aromas, don’t miss out on fragrant Savini truffles, oils and condiments enriched with the earth’s precious gifts. An essential culinary component is oil. A 100% Italian, truly extra-virgin oil will be presented by Salvagno, alongside many other delicacies. A delicious array of Italian cheeses and equally rich salamis will be showcased by the Bernardini brand, in particular from Tuscany which appreciates intense, bold flavours. From Tuscany to Friuli, to a prosciutto stand where Dall’Ava rules supreme with its Dok brand, a San Daniele of the exemplary quality necessary for this historic speciality from the extreme north-east of Italy. Spain is represented by Joselito, who produce the best jamon in the world. Finally wine, every year Longo Un Mondo di Specialità offers Christmas Wines, Champagne and Sparkling Wines, the best from its catalogue. Enoteca Longo di Legnano, twice winner of the Oscar del Vino, will offer the finest labels, selected from the most prestigious red, white, sparkling and dessert wines in Italy. As well as France, with a special stand for champagne presided over by the Henriot champagne house from Reims, whose business has been in the same family for seven generations. Follina beer, also called Serravalle, created by the expertise of the eclectic Trentino celebrity, Giovanni Gregoletto, will satisfy the tastes of all those who prefer beer. Trentino is also the home of grappa from the Pilzer distillery. The slopes of Val di Cembra see the distiller’s art in action, in the shape of its countryman Francesco Moser. Since good things are even better if partnered with the beautiful, CityLife’s Mercatino del Gusto has reserved a stand for household items by celebrated worldwide designers and created by Alessi. A stroll among the stands at CityLife Mercatino del Gusto will offer so many sensory experiences, the opportunity to appreciate Italian artisan culinary heritage, store much useful information, and to become used to choosing quality. And, of course, it is the perfect opportunity to find gifts for friends and relatives. The gift of food is an art form. This is the message that those who come to CityLife Mercatino del Gusto will take away.